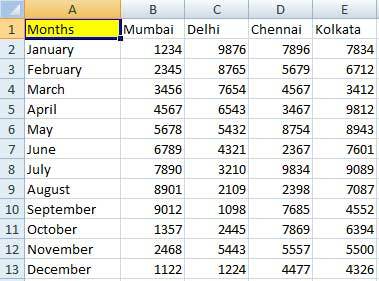 Formatting Excel sheets is a thing that you will start today and format it till the next week and still it will look the same or even worse. 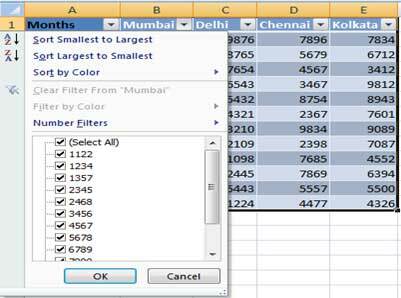 But formatting is important as it does not only make the excel sheets look more presentable but also makes it much easier to understand. So today, we bring to you some important formatting tips that will make your data presentable and user friendly. Use Tables to Format your data quickly – It is important that your data looks presentable before formatting and tables are the best option. Tables will ensure that your data is quickly formatted as required by you. Follow these simple steps to create the table. 1. Select that data that want to format and press Ctrl + T.
1. 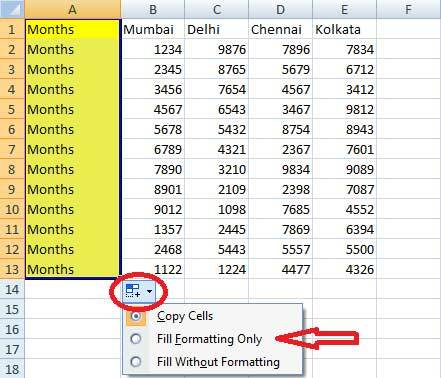 Select the cell that contains the formatting. 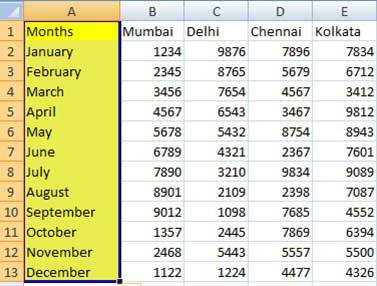 For example (refer image 3) I want to add a yellow background to the entire column of months. 2. So I will select the cell containing yellow background and shall double click on cells fill handle. Use Format painter – Format painter is one of the most easiest tool that one can use for formatting. 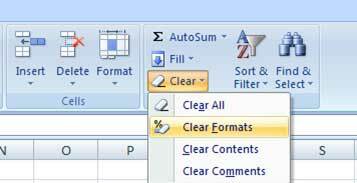 If you have same data that needs to be formatted then you can use this tool by following these simple steps. 1. Select the already formatted data that you wish to copy. As it can be seen in Image 6 I have seleted the data in from A1 to E13 as I want the same formatting in the data ranging from H1 to K10. Clear all Formats – Sometimes when you want to start afresh and do not require any of the formats, then you can simply select the cell which need the clearing of formats and go to Home> Clear > Clear Formats and your data shall be format free. We hope that these tips will help you in impressing your Boss/Professor and if you think that we have missed out some important ones then you can let us know through the comment box below.